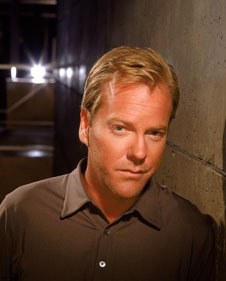 Kiefer Sutherland plays the heroic anti-terror agent Jack Bauer on the non-stop action series 24, where he won an Emmy in 2006. He is the son of noted film actor Donald Sutherland and award-winning Canadian actress Shirley Douglas. His maternal grandfather, Tommy Douglas, was a prominent Canadian politician widely credited with developing that country's system of socialized medical care. His parents divorced when Kiefer was five, after his mother was arrested for allegedly trying to supply the Black Panthers with weaponry. She has always maintained that she was set up by the FBI. Sutherland was raised primarily by his mother in Toronto, with occasional visits to his father's many movie locations. He attended three private high schools but never graduated, and instead earned the nickname "Reefer" Sutherland. He made his first professional appearance on stage at the age of 11. His first film appearance came at the age of 17, in Max Dugan Returns with his father and Jason Robards. His breakthrough roles came as the "cheap dime store hood" in Stand By Me with Wil Wheaton and River Phoenix and the wild teenaged vampire in The Lost Boys with Jason Patric. His best films include A Few Good Men with Jack Nicholson and Tom Cruise, the underrated science fiction classic Dark City with Jennifer Connelly, the brutal prisoner-of-war drama To End All Wars with Robert Carlyle, and the wired thriller Phone Booth with Colin Farrell. With his long-time friend Jude Cole, Sutherland owns Ironworks Music, an alternative label that seeks out and promotes bands that do not fit the 'corporate music' mold. The label's better-known artists include Lifehouse and Rocco Deluca. Sutherland also developed an fondness for horses while making Young Guns and Young Guns II, and wandered away from his Hollywood career for a few years to compete on the rodeo circuit in the late 1990s. Sutherland was named for Warren Kiefer, who directed his father's first prominent film role, Il Castello dei morti vivi (Castle of the Living Dead) starring Christopher Lee. Actress Blythe Danner and her husband director Bruce Paltrow were family friends, which led to Sutherland's occasional work as babysitter for their pre-teen daughter Gwyneth Paltrow. He was engaged to Julia Roberts after they fell for each other making Flatliners, but she dumped him just days before their scheduled wedding. His stepbrother Rossif Sutherland is an actor who played Dr. Lester Kertzenstein on the long-running ER. Sutherland's first wife, Camelia Kath, had been married to brilliant Chicago guitarist Terry Kath until his untimely death, and Sutherland's stepdaughter from that marriage, Michelle Kath, is married to rising Scottish actor Adam Sinclair, star of Van Wilder 2 and the British series Mile High. Sutherland was convicted of drunk driving in 2004 and ordered to perform fifty hours of community service. A few days after Christmas 2005, he was spotted sloshed in a London hotel, where he repeatedly threw himself into a Christmas tree, then ripped its branches off and threw its ornaments onto the floor. Spectators said Sutherland had very politely asked the hotel management's permission and agreed to pay for any damages before destroying the tree.